In this article, we share some high-level insight into what brands are doing to differentiate themselves on an ever-overlapping landscape, and how higher ed brands can learn from them. Authenticity is the new gold standard. Younger audiences want to know more about your brand, in a real-world context. Your communications compete with the communications of all other brands, regardless of medium. You’ve got to be authentic, while also standing out. Brands are rethinking how to tell their story across a diverse channel mix. Winning brands set a strategy, created for their audience, and deliver on that audience’s channels. Interests are the new demographics. Major brands have used experts to build awareness and enthusiasm for their brand promises. Universities are the original sources of expertise and can use partnerships to extend their expertise for public influence and appeal. Become an expert on your brand promise. Cultivate a diverse team of advisors. This doesn’t mean data isn’t important. It is. It just means it is not going to be your silver bullet. 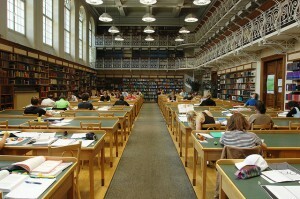 Most universities use familiar and undifferentiating data points to promote their institutions. The key is to find new ways of using this data, to support a story rather than be the story. External research should be used to inform decisions, but not drive them. Promote your vision of the future. Identify unique metrics that matter. Researchers have reaffirmed the campus visit as the most important decision factor for prospective students, because it helps them see themselves on campus. Universities have many experiential opportunities: from athletics to alumni events, to on-campus celebrations, and community engagement and services. Don’t be afraid to be important. If Universities allow themselves to be the experts, take care not to over-rely on traditional data, and think about coordinated experiences rather than individual channels, they will benefit from the same successes that the world’s great brands have had. Commitment to these ideas will help Universities break from traditional and undifferentiated approaches, to establish their own valued space in the world. Many organizations – whether corporations, non-profits, or educational institutions – develop broad stables of identities to segment their offerings to different audiences. Some of them succeed with this strategy, but many of them do not. 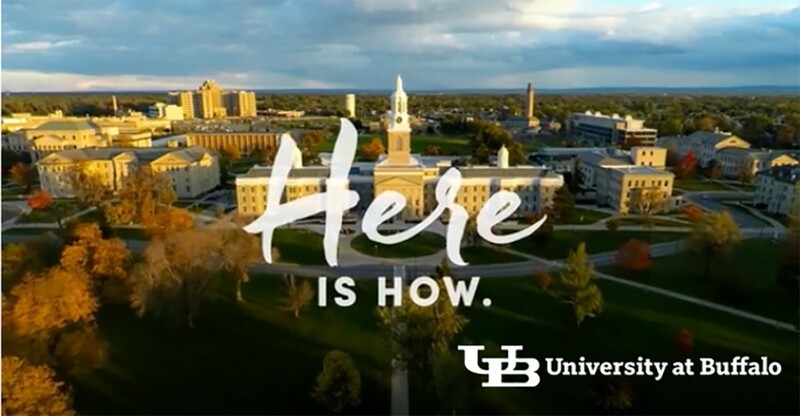 Our client, The University at Buffalo (UB)’s recent success can help explain why a singular identity lends more collective strength to an institution than can a handful. UB is an AAU institution, which means it has been carefully selected to sit among only 61 peers in the American Association of Universities. It is the largest and most comprehensive research university in the SUNY system, and has multiple nationally ranked departments. Over the years, however, UB has had multiple names, and adopted specialized identities for athletics and other departments. These changes had a dampening effect on awareness, appreciation and internal pride. Now, the university is committing to a singular identity, backed by a strong and unifying brand strategy, and is already reaping huge rewards in local pride and national momentum. In Marshall Strategy’s work with leading researchers at Caltech, UC Berkeley, UC San Francisco, UC Santa Barbara and Rockefeller University, it has become obvious that today’s most important issues require not just brilliant people, but people who have the skills for working with others productively. 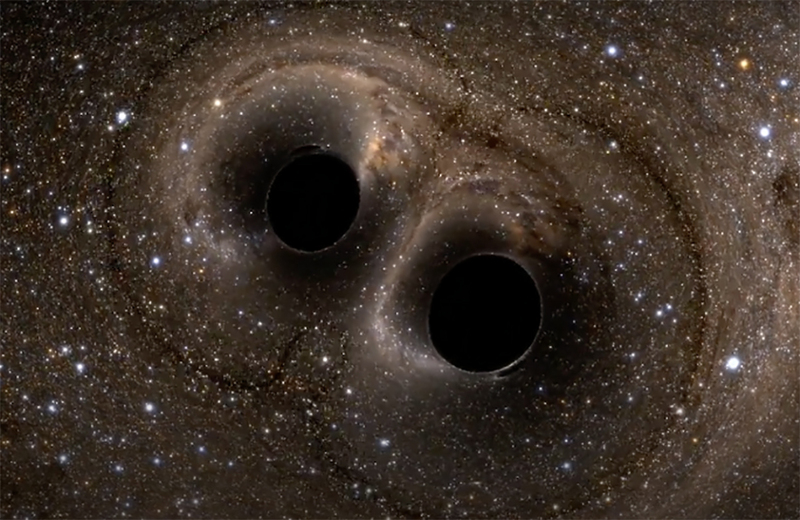 For the first time, scientists have observed ripples in the fabric of space-time gravitational waves, arriving at the earth from a cataclysmic event in the distant universe, opening a new window on the cosmos, and confirming Einstein’s Theory of Relativity. This was only made possible by large groups of people working together and points out the importance for universities to not only impart knowledge, but to impart the skills required for working with others successfully. This applies to all significant areas of human endeavor. Large companies—like GE, Google, Samsung and others—know this law of branding firsthand: As you grow in size, you will grow in complexity. 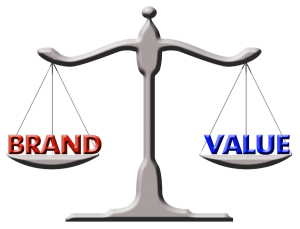 Acquisitions, organic growth, market segmentation and product and service extensions all add complexity to brand portfolios. How should large successful brands such as these manage brand complexity? Growing companies realize they need to support the strength and cohesiveness of their corporate identities, while also accommodating the needs of their individual brands and sub-brands. We call this “brand balance.” This balance gets harder to control as you grow; there is a very real complexity curve that gets steeper with a company’s size. To remain successful as you grow, it is important to learn how to stay ahead of this complexity curve. When we look back at the client relationships we’ve enjoyed over this last year, there’s one word that sums up our experience: Inspiration. Our clients have shown both resilience and initiative in a time of uncertainty and recovery. In coming to us for help, they’ve shown they are committed to a renewed identity, a stronger position, or a clearer message to communicate to their audiences. We have been thrilled to assist these groups through this process. There are several examples from this past year of clients doing extraordinary work to further their missions, and build their brands in the process. Our higher education clients, such as Georgetown and Caltech, set examples everyday of their innovation and thought leadership. UC San Francisco and Highmark, our clients in the healthcare field, are working to improve the quality of care and increase patient satisfaction. 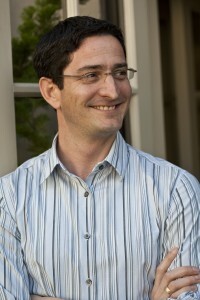 And in the technology sector, VMware is technology that makes any service ubiquitous, efficient and within reach. It is easy for an organization to tolerate fuzzy thinking, let costs rise and lose sight of their mission. We’re proud of the committed work our clients do remain at the vanguard of higher education, healthcare and technology, and we see many good things ahead for them. We are inspired as we go into 2014. In one of my colleague Jon’s recent posts, he wrote about one sign that you may need to reconsider your identity: your industry is changing. One industry we work in frequently—higher education—is currently going through significant change. Societal trends, shifts in funding priorities and emerging technologies are all contributing to increased competition: for the best students, for top faculty, for funding, for leadership and for reputation. Against this backdrop, branding and identity are increasingly important. “[A] properly constructed brand is essential for any university competing in the modern global education market,” wrote Ian Pearman, CEO of the UK’s largest ad agency, in a recent piece on the importance of higher ed branding (“Universities are brands whether they like it or not”) that accompanies a global study of the 100 most powerful global university brands. 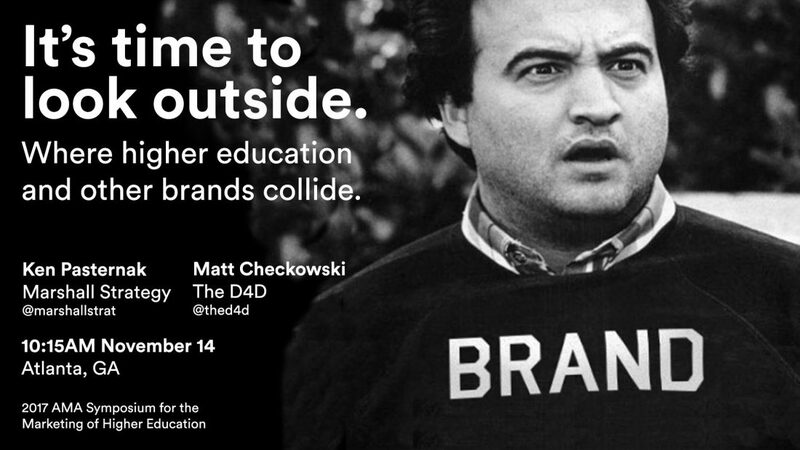 But branding and higher ed have an often uneasy relationship. Research conducted at the University of San Francisco looked at the impact of branding on California institutions (including several of our clients) and found positive correlations between branding and campus identity, enrollment and foundation initiatives. In spite of this, many don’t see a role for branding and positioning in helping their schools achieve greater success. In our work with higher ed clients we’ve sometimes encountered a sense that academia should be above branding. For some, the word itself is synonymous with marketing or advertising, and there is the perception that this cheapens the important work that educators and researchers do. A development campaign created by our client UC Berkeley matched students’ portraits with quotes on what the school meant to them. The fact that “We are not a brand” was graffitied on a poster installation reveals strong opinions about brand in the context of higher education. There are ways to navigate around this. 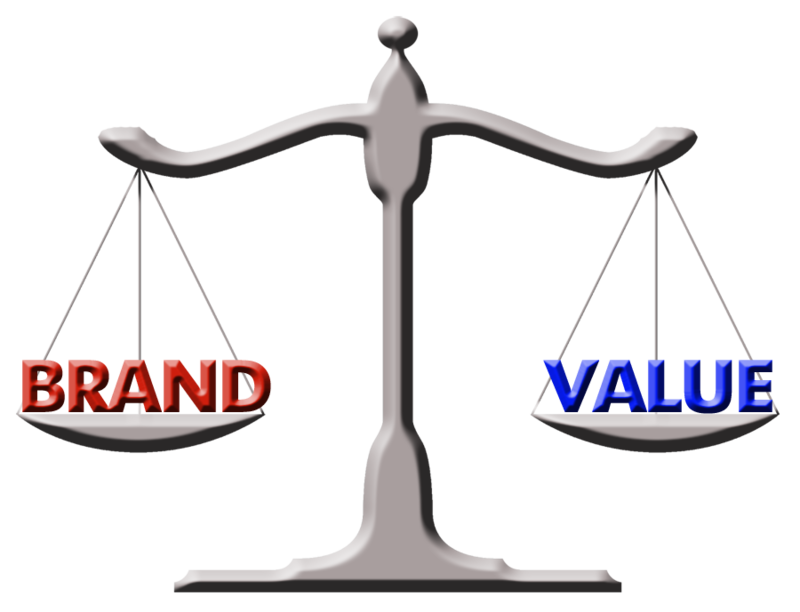 When working with higher ed clients, we often refrain from using the word “brand” and instead talk about “identity.” This focuses the conversation on the key issues: who you are, what you do and why you matter. When put in those terms, we find that many in academia are comfortable with, even enthusiastic about what our work can help them to achieve. As the educational landscape becomes more and more complex, it’s increasingly important that higher ed institutions think hard about how they can frame their offerings for perspective audiences. I think back to my own experience as someone trying to decide where to attend graduate school. I was living in Southeast Asia at the time and ill-equipped to form a consideration set for what would be an incredibly important life decision. Institutions of higher learning may want to keep themselves above the fray of “marketing,” but by communicating a clear sense of identity, they can certainly help their audiences understand who they are and what they have to offer.